In this class, we will go over the basics of hand quilting, including preparing the layers for quilting and marking a design either by hand or with a stencil. Download the newsletter for complete info. Sunday, April 28, 1-4 p.m.
Each year, Cynthia designs a new block of the month for the shop. We've done many types of quilts over the years, but never a Christmas quilt. It's long overdue! We'll have 12 quick-lecture classes to make 16 blocks, and then get the fabrics to go home and sew. Please download the newsletter for more info. Mary Beth loves hand applique, and she's excited to share that love with you! We're going to do a block of the month (or rather, two blocks each month) using wool hand applique. Signing up for this session means getting only the kits, not instruction. 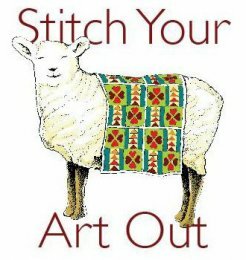 If you're new to wool applique, then take the class (which falls on the first two days of the block handouts). Mondays, Jan. 14, Feb. 11, Mar. 11, Apr. 22, May 20, and June 24, from 9-9:15 a.m. It's time to get inspired and to set yourself free! This class meets once a month, and its objective is to spark new ideas in not just you, but also everyone else in the class. This class is lecture/discussion based, and you'll sew (or do whatever craft you wish) at home. Download the newsletter for more info. Mondays, March 25, April 22, June 10, and July 15, from 6-9 p.m.
Everyone loves this darling quilt! You can make it as a small baby quilt, or go for the twin size. Caryl will show you how to work with wee pieces to make the cutest animals ever! Download the newsletter for more info. Wednesdays, Apr. 17 & 24, 6-9 p.m.
Landscape quilts are classics! Come with a vision (vague is okay! ), and Deb will help you pull it off. Please download the newsletter for more info. Tuesdays, Apr. 16 & 30, 6-9 p.m. If you've never paper-pieced before, this is the perfect block for beginning. It looks tricky, but it's a simple, straight line. Come learn all about it! Please download the newsletter for more details. Mondays, May 6 & 13, 6-9 p.m.
You've vowed to do this for years, but have decided that now is the time! You are going to learn how to quilt! Let us get you started with a project that will show you how to use a rotary cutter and to match corners. Click to sign up here or call (814) 238-4151. Tuesdays, Jan. 22 & 29, OR Thursdays, Mar. 14 & 28, OR Wednesday, May 8 & 15, all 6-9 p.m.
Let's go beyond the X-across squares! Learn to use your walking foot to quilt your pieces, to its best advantage! Be sure you have a working walking foot for your machine. Please download the newsletter for more info. Chose of Sunday, Jan. 27, OR Sunday, Mar. 17, OR Sunday, May 19, all from 1-4 p.m.